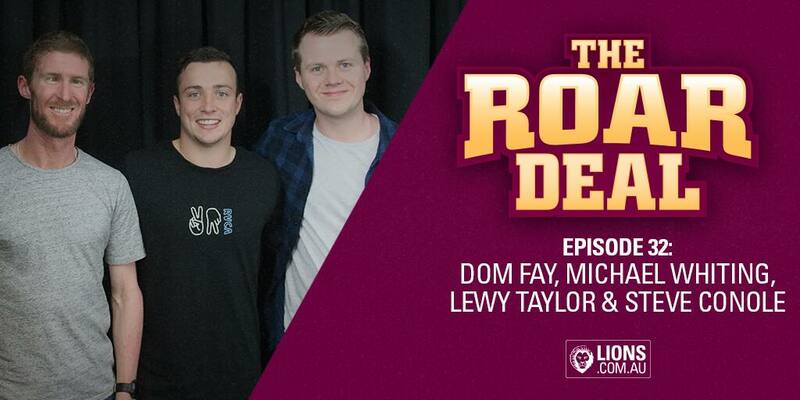 With his 100th game just one week away, Lewy Taylor (@54.53) joined the Roar Deal podcast this week with hosts Dom Fay and Michael Whiting. The past five seasons since being drafted have gone by very quickly for the small forward known as ‘Squizzy’. “It does feel like it’s gone quick,” Taylor said. “One of the first things you get told when you come into the AFL is that time flies and next thing you know you’re in your fifth year. Taylor had his say on the Harris Andrews incident and how it felt to be on the field at the time. “I’ve seen him in and around the Club this week. I obviously sent him a message after the incident,” he said. “He's in good spirits. It’s a bit disappointing as he is a very handy player and in great form, so he will be sorely missed. “His health is priority number one so hopefully he can get back to playing footy soon. In his chat with Fay and Whiting, Taylor also discussed his housemate Darcy Gardiner, the group chat dedicated to dogs the players have going and the upcoming trip to Perth. While it may seem like the season is just getting going, the 2018 AFL Draft is fast-approaching. The Lions’ National Recruiting Manager Steve Conole (@14.42) sat down with Fay and Whiting to preview the upcoming draft and discuss the top prospects. Conole, who works out of the Lions’ Melbourne office, is currently in Brisbane preparing for the back-half of 2018. “It’s a great chance to catch up with our staff who help out with the combine and start to put some plans into action for the second half of the year,” Conole said. “There’s a fair bit of talent in the 2018 Draft. It has a lot of variety, which is what really appeals to the industry and is why it’s been so heavily promoted. “In the top 15 there are so many different types of players. It’s going to be really interesting to see what type of players fall at what picks. Conole was coy on what type of players the Lions will look for in the draft. “There’s always room for talent. Some more midfielders in our group would certainly be a positive. “In this year’s draft, in terms of the talls there are some super athletic players...the King brothers and Jack Lukosius. Conole also talked about Jarrod Berry’s younger brother Thomas and how he reflects and analyses previous drafts. The 32nd episode of the Roar Deal started with a bang, as Whiting shared some very exciting news with Fay. Make sure you tune in to find out what it is!